One of the first things most people think of when they hear “comfort food” is meatloaf. Everyone has their favorite go-to recipe for meatloaf and I always say if you ask 10 people for their favorite recipe, you’d get 10 different recipes. If you’ve ever been to Cracker Barrel, America’s “comfort food” restaurant, chances are you’ve tried their meatloaf. But if you haven’t, here’s a chance to make one just as good as theirs right in your own kitchen! 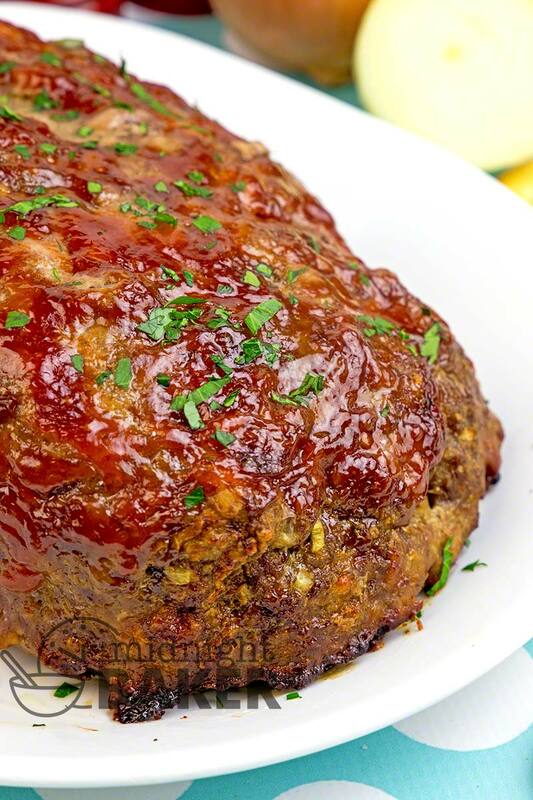 There’s versions of this meatloaf all over the internet. I found the recipe I based this one off of on Best of Long Island and Central Florida blog. 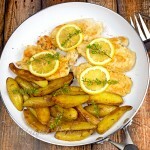 Linda was a weekly participant in the blog hop I used to run and she really makes fantastic dinners. I also love that her Retriever is a big part of her blog being a fellow dog lover myself. I know if she said that this was good, I was sure to like it too. 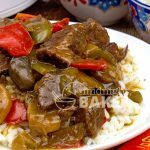 One thing I did notice from all the recipes I looked at was that they seemed to exclude one of the original ingredients–green pepper. Maybe those folks didn’t like that taste or for dietary reasons could not eat it. I chose to add it back, albeit a small amount because I wanted an essence but didn’t want that flavor to overpower the others. Another thing I did differently was add an extra egg, merely because I felt the mixture needed it and substituted extra-sharp cheddar for either the mild cheddar or American cheese the restaurant uses. I also shredded my own cheese because I feel freshly shredded is far superior to the stuff in the bag. 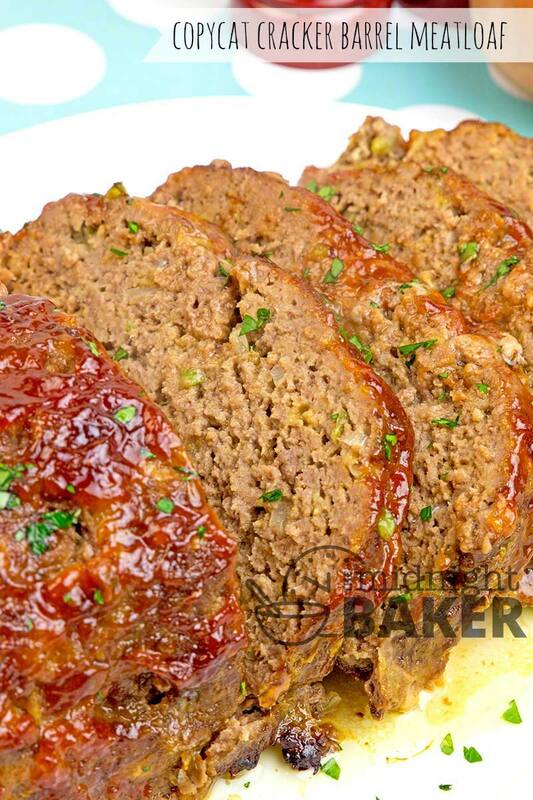 This sweet and sour topping is the perfect thing for this meatloaf! 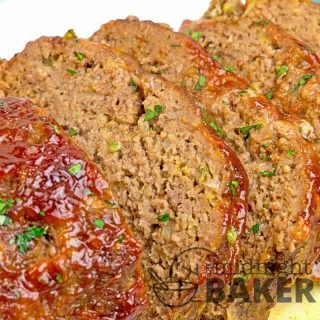 It’s simple with common ingredients and when it bakes on top of the meatloaf it gets thicker and sticky. Putting bad manners aside, your first thought is to gleefully lick it all off the top of your slice–you can do that when no one is looking!!! You can use any mustard since there’s only a teaspoon. I used spicy brown–my store’s brand–and it was very good. However, yellow or dijon would be excellent choices too. Preheat oven to 350 ℉. Line a baking sheet with parchment or aluminum foil. Mix the topping ingredients in a small bowl; set aside. In a large bowl, beat the eggs then add the cracker crumbs, onion, green pepper, milk, salt, pepper and cheese; stir to combine. Add the ground beef and mix well. Turn out the meatloaf mixture onto the prepared pan; shape into a loaf. Bake for 30 minutes then spread topping on top of the meatloaf. Bake for an additional 30 minutes or until the center is 160 ℉. Let stand for 5-10 minutes to rest, then slice and serve. Hate to burst your bubble but the toppings used at Cracker Barrel are just ketchup put on after it’s cooked! So that makes this one better than the original!!! This topping is delish. Oh my I’ve eaten that meatloaf many times since it was my late friend’s favorite go-to meatloaf recipe. 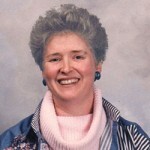 Sad that she recently passed on and I will make it in her honor!! Your gravy sounds awesome!!! I’m going to try that too!!! I’m not too good at guessing the amounts to put into recipes. 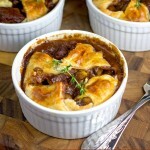 Could you explain the gravy recipe and maybe add in the amount of water, beef base, flour, etc.? I think you’re talking about a different recipe as this has no gravy. 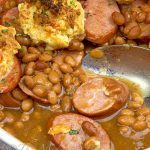 You can use the “contact” form on my site if you cannot comment on that recipe. Make sure you let me know the recipe. 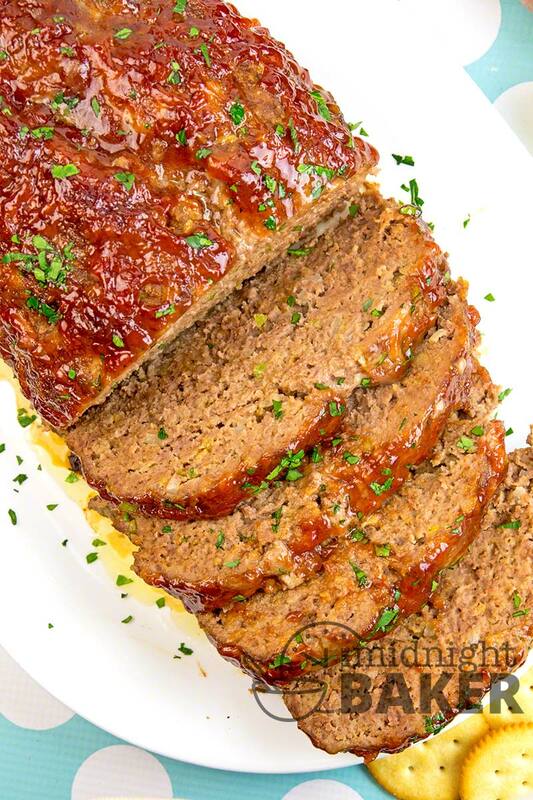 In relation to Mikes comment… I’m a meatloaf fanatic and I will say ANY meatloaf with just ketchup? Why not just make hamburgers then? I agree thus glaze is scrumptious and no ketchup will ever top my meatloaf. I’ve used this same glaze many years until I switched to a ketchup/Brown sugar/Worcestershire sauce… maybe Cracker Barrel could use some advice or maybe don’t comment unless you have reason to, which it seems you had known. If it makes you happy…try it and put KETCHUP on it. Could be he went there when there was a rogue chef on duty who was having a bad-hair day. That does happen and I have experienced it a few times too. Any time I had it there the top was great. My neighbor uses a glaze similar if not the same. for us Canadian people who aren’t privileged enough to get Ritz crackers in tubes, could you give us some idea of how many a tube holds? Up here Ritz just tosses all the crackers loose in a bag and usually you end up with 1/4 of them broken or crushed. If I had to guess, I’d say there’s about 25-30 crackers in each sleeve. But when I crushed the amount in the recipe, it appeared to be about 1-1 1/2 cups. We have the same problem here with the sleeves–a LOT of broken crackers. You could do either. It’s just my preference to do it on a baking sheet because it’s easier to cut and since I line the sheet, nothing to clean! Great, thanks! I ended up using the baking tray and this recipe was delicious! Can we. use ground turkey instead of ground beef ?